'Gerald Suster (1951-2001) can be considered one of the most important occultists of the late-20th century. A prolific writer, esteemed historian and advocate of Thelemic Magick, he is best known for his biographies of Aleister Crowley (The Legacy of the Beast) & Israel Regardie (Crowley’s Apprentice). 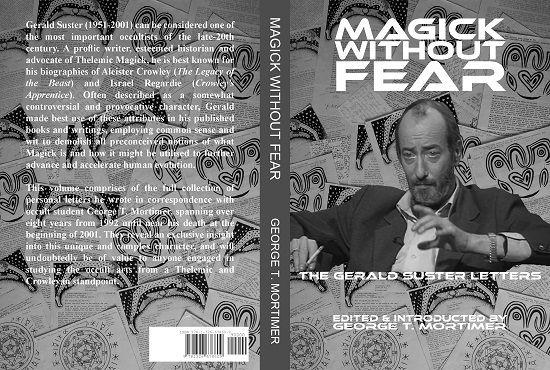 Often described as a somewhat controversial and provocative character, Gerald made best use of these attributes in his published books and writings, employing common sense and wit to demolish all preconceived notions of what Magick is and how it might be utilised to further advance and accelerate human evolution. Note: my sincerest apologies for the somewhat hefty price of £24.99 which is due primarily to the greed of third party retailers like Amazon. For a company that has cornered the market in just about everything, they certainly like a large slice of the pie in return for promotion and quick turnaround delivery. Rest assured, however, that I am currently looking into setting up an individually run online store in an effort to undercut the set price of this book quite considerably, and I hope to also offer signed copies for those who want it. That said, the book comprises of 428 pages in A4 format (20.98 cm x 29.69 cm) and publishers Lulu have done an outstanding job on the quality and production. If you are going to buy it, please consider buying direct from the publisher. Even though they can't offer as quick a turnaround in delivery as Amazon, it is worth doing just to stick the finger up to multinational corporate greed. (Lulu shop). Note: be sure to keep an eye out for Lulu discounts on their promotions page. (Lulu discount codes).